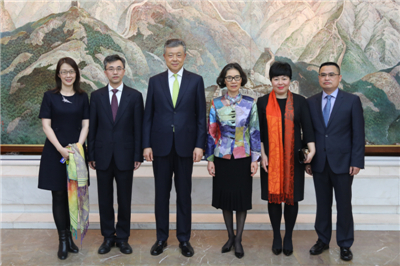 On February 19, Ambassador Liu Xiaoming and Madame Hu Pinghua hosted a reception to bid farewell to Minister Zhu Qin and to welcome Minister Chen Wen. Over 120 people were present, including the Rt Hon. Lord Howell of Guildford PC, Chair of the House of Lords International Relations Committee, Barry Gardiner MP, Shadow Secretary of State for International Trade, Mark Hendrick MP, Vice Chair of APPCG, the Rt Hon. Andrew Mitchell MP, Jeremy Lefroy MP, Kate White, FCO Director of Asia Pacific, Caroline Wilson CMG, FCO Europe Director, Creon Butler, Director of Cabinet Office, Michael Charlton, Managing Director & Chief Investment Officer at Department for International Trade (DIT), Brigadier General Simon Levey, Head of Foreign Liaison Staff (FLS), MoD, Nabeel Goheer, Assistant Secretary-General at the Commonwealth Secretariat, David Sayer, Vice Chairman in Financial Service of KPMG, Fang Wenjian, Chairman of CCCUK, Cllr Ian Adams, former Lord Mayor of Westminster, Roula Khalaf, Deputy Editor of the Financial Times, Andrew Roy, Foreign Editor at BBC News, and other guests from the government, parliament, industry and business, education and culture, army, and media sectors of China and the UK and resident diplomats to the UK from Poland, France, Japan, Singapore Turkey and other countries, as well as representatives from Chinese institutions and overseas Chinese. Talking about the close bond Minister Zhu and Minister Chen had with the UK in his speech, Ambassador Liu affirmed their commitment to advancing China-UK relations, and praised them for being broad-minded, open, kind, sincere and humorous friends and good team workers. 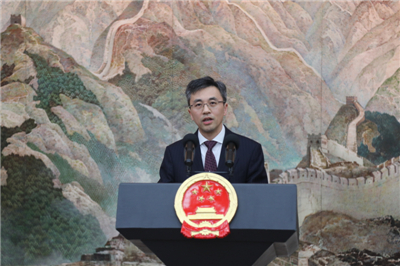 He noted that this year marks the 65th anniversary of the establishment of China-UK diplomatic relationship at the level of chargé d’affaires, China and the UK are both standing at a new starting point. He hoped that the two Ministers and friends from all walks of life could seize the moment and let their dream drive them forward to achieve sound and sustained development of the China-UK “Golden Era”. In closing, the Ambassador sent his best wishes to Minister Zhu and Minister Chen. 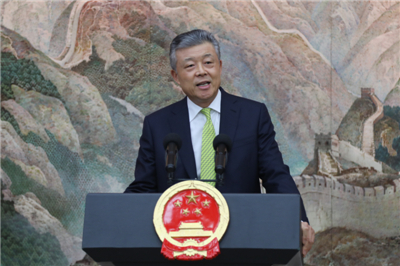 Minister Zhu thanked Ambassador Liu for his guidance and compliments and expressed his appreciation for the support and help of British friends, saying that it had been a joy witnessing and participating in the cooperation between China and the UK in the areas of the Belt and Road Initiative, economy and trade, and people-to-people and cultural exchanges. 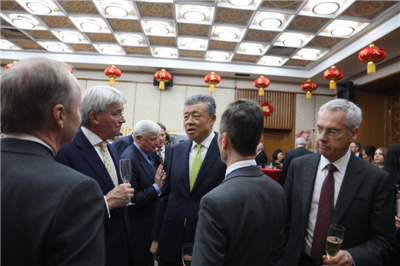 He pledged to continue to take an interest in the development of China-UK relations. With the joint efforts of the people from various sectors in both countries, he said, China-UK relations will surely have a brighter future. 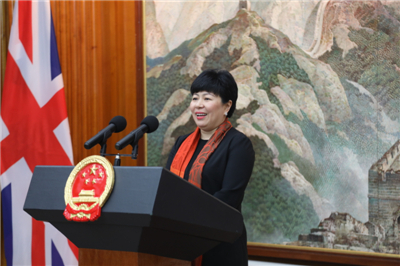 Minister Chen thanked the Ambassador’s trust and encouragement, saying that under the leadership of Ambassador Liu, she will work harder and forge ahead. She looks forward to collaborating with her colleagues of the Chinese Embassy and British friends from all sectors to achieve greater progress in China-UK relations. The guests acknowlege that as China’s international influence expands, Chinese diplomats are highly regarded. Ambassador Liu is an outstanding representative of senior Chinese diplomats and Minister Zhu and Minister Chen are both excellent representatives of the new generation of Chinese diplomats. The event enables guests to have a deeper understanding of the devotion and dedication of Chinese diplomats. Speaking highly of Minister Zhu’s contribution to China-UK relations and cooperation during his UK term, they wished Minister Zhu more success in his new position. They also extended their congratulations to Minister Chen on taking up the new position and looked forward to working with her closely to make new contribution to the development of China-UK relations.